Don’t guess how much nitrogen you have left in your soil – know how much. 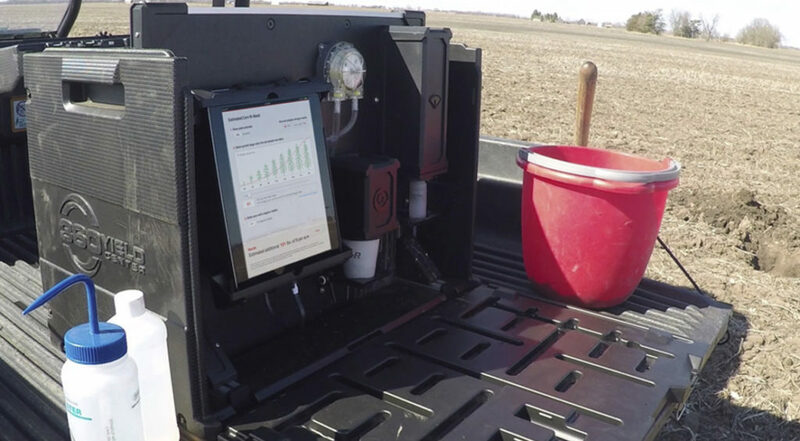 360 SOILSCAN is a portable soil testing system that lets you accurately test nitrate nitrogen availability and soil pH right in your field and in about five minutes. Understanding nitrogen availability in real time takes a system designed for the challenges of the field. With 360 SOILSCAN, you are able to have a soil testing system that is durable, portable, and just as accurate as a commercial soil lab. Step 2: Place two scoops of soil into the provided cup and place in the mixing station. Real-time measurements mean nothing without accuracy, which is why 360 Yield Center participates in the Agricultural Laboratory Proficiency (ALP) Program – a national proficiency testing program that monitors soil analysis for consistency, accuracy and reliability. Knowing how much nitrogen remains in the soil and how much you need are two different things. With the Corn Nitrogen Need Calculator in 360 SOILSCAN, you are able to build customized nitrogen application plans instantly after measuring your soil simply by inputting your yield goal, crop growth stage, and soil organic matter. We have taken in-season field monitoring and soil sampling to the next level with the 360 YIELD PATROL®, a new 360 SOILSCAN companion app for your iPad and iPhone®.